A Spirit Doll is a very special handmade doll that embodies hopes, dreams, and prayers. She is a messenger of your own inner voice, allowing you to communicate with the parts of yourself that are often hidden, or deeply protected. She inspires a deep connection to your spirit, awakening the truth and allowing personal transformation. The idea is to place your spirit doll somewhere where she can watch over you. 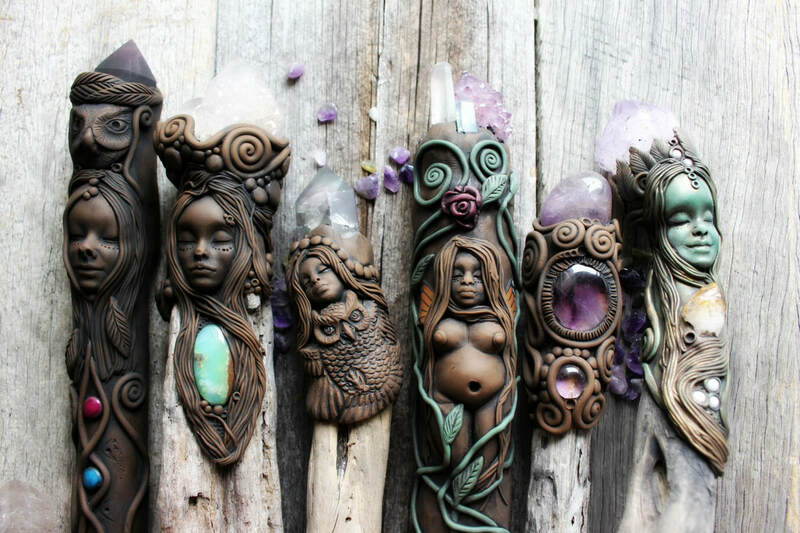 Some special items that I have created include Crystal & Driftwood or Crystal and Tasmanian Oak Wands as well as wands with a combination of gemstones and clay. A wand is a tool with tremendous legendary significance as a source of power and magic. 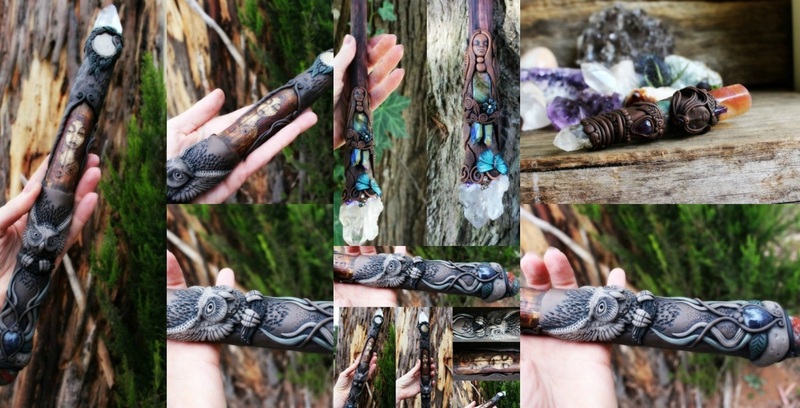 From ancient religious rites to many modern ceremonial practices, wands are used to signify a wielder of power. 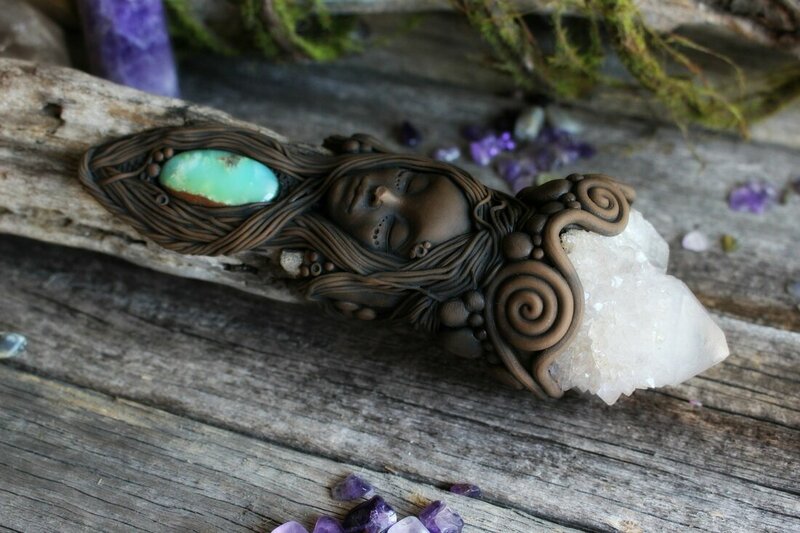 Many modern shamanic and esoteric practices include the use of a ritual wand. 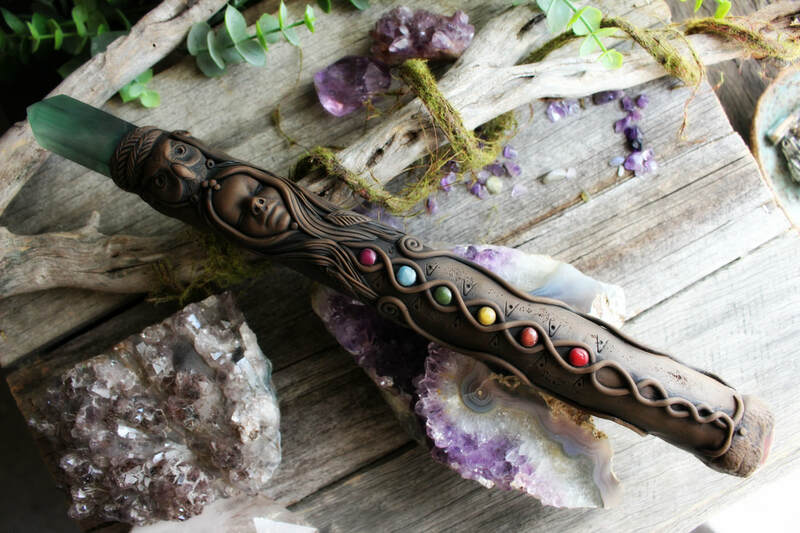 The wand is an instrument of invocation of spirits and serves primarily to direct spiritual energy. The wand dates back to prehistoric times. Some of the first depictions of a wand come from Egypt. Although you can purchase a wand from an artist like myself, there's something very special about making your own wand as well. A wand is typically made from wood. Depending on what energies you want to associate with your wand will depend on which wood you choose. There have many different types to choose from. Oak and Ash are the most commonly used on the pagan paths, because of the spiritual reference to these two trees. But white pine, maple and apple are also popular choices. 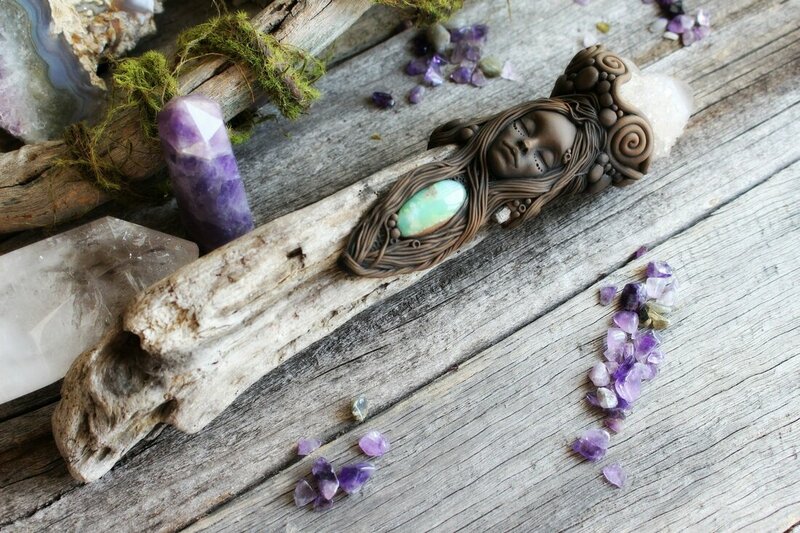 The wand has been used for centuries by witches to help them create their magic it is a precious tool and an integral part of a witch’s bag of tricks, the wand was and is used for healing as well as spells and magic, it can be used to charge a plant or herb with special powers of healing, it works especially well with Bach flower remedies. The wand is used by the witch pointing the wand and directing the energy, often using silent word spells to empower the wand. The symbolism of a mirror: It is symbolic of the Moon, for as the Moon reflects the Sun's light, as is the mirror an object of reflection. As it is a lunar symbol, the mirrors used in magic through the ages were generally round. Send me now the second sight. Mirrors were also used in divination. Mirror scrying is an evolved form of water scrying. When it became possible to build mirrors they were regarded as being like water that was fixed into one place. The early mirrors were made of polished copper, brass, marcasite, tin foil or mercury behind glass, polished silver and obsidian.